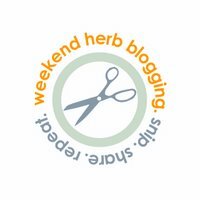 This week, Weekend Herb Blogging is being hosted by Cooking Adventures of Chef Paz, since that busy lady Kalyn is attending the Blogher conference in California. Although the title is weekend HERB blogging, the rules just requires that the post be about an herb, plant or flower. I thought this would be a great way to show off these beautiful swiss chard. I just wish there was a way for me to preserve the colorful stalks. With the abundance of swiss chard from our garden, I have been on the lookout for different ways to cook chard. The girls tend to favor them plainly sauteed with just a bit of butter, but I like to try new recipes, and they gamely indulge me sometimes. This is one of those times. While bloghopping not too long ago I ran across a post about chard on the Scent of Green Bananas. 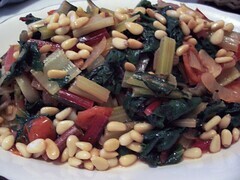 This is where I got this idea of spicing up chard, but I used pinenuts rather than peanuts as Santos did. Heat butter and olive oil and saute’ the garlic and onion until fragrant. Add the tomatoes and cook until onions are translucent and tomatoes start to render their juices. 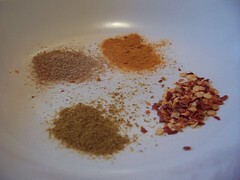 Add the spices and cook another minute stirring occasionaly. 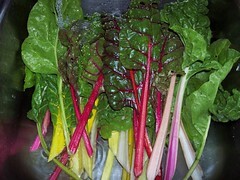 Add the swiss chard which have been washed and cut into one inch lengths. Season with kosher salt and fresh cracked black pepper. Cook just until chard wilts and sprinkle with toasted pinenuts just before serving. Thank you, Chef Paz for hosting this week’s WHB. Hi Melanie, my girls also love chard. They even love it better than spinach and they are in the same family! go figure. It probably has something to do with the pretty colors 🙂 Gosh, I miss Trader Joes. Wish we have one here in NC. Thanks for the info. Oh, I have been enamored by chard lately. I had a dish a few weeks ago that even had my 11-year-old stepson gobbling up his green leafy vegetables! I will definitely try this! btw, that dish was the one on the back of Trader Joe’s bag of “Chard of Many Colors.” I know, geeky of me, but it was simple and easy to cook and very tasty. I look forward to venturing out with pinenuts. It’s okay since I am not logged in that’s why my comment is in moderation.